Most of the people we UTV with also ride dirt bikes and/or ATVs, so they wear off-road, full-face helmets. 6D Helmets is dedicated to reducing traumatic brain injuries with next-level helmet technology. 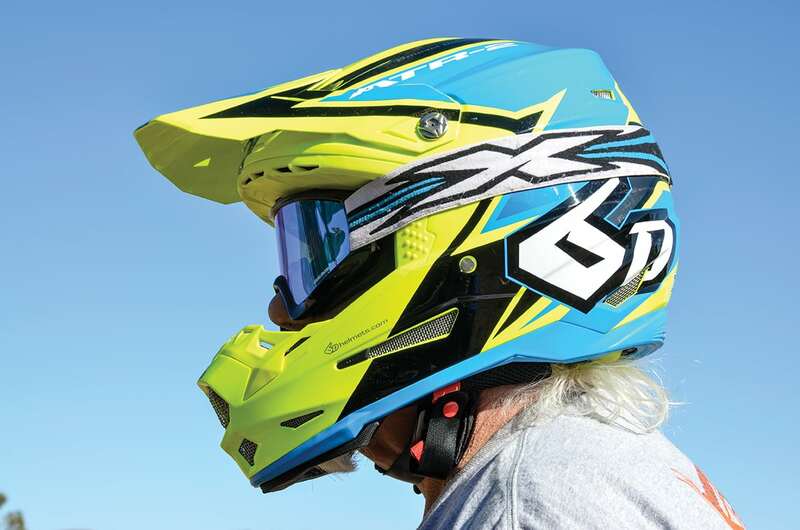 The ATR-2 off-road, full-face helmet uses 6D’s second-generation evolution of the company’s signature Omni-Direction Suspension system (ODS), and the ATR-2 includes numerous additional features to enhance overall safety for motorsports enthusiasts. Basically, 6D incorporates a suspension system between the Expanded Polypropylene (EPP) multi-impact outer liner and a new Expanded Polystyrene (EPS) inner liner. The two liners are connected via a series of elastomeric isolation dampers and damping towers with low-friction discs. The $695 ATR-2 has noticeable movement between the bottom blue cervical protection zone and the yellow EPS innert liner. For comparison, Arai’s VX-Pro4 is $609.95–$749.95 without advanced ODS or MIPS. Start with an optimized, lightweight tri-composite shell (actually, there are three sizes for perfect fitment) with air-gap ventilation featuring 17 transfer ports. Lay in a multi-impact EPP outer liner and replaceable EPS inner liner for low-cost rebuilding. In between the EPP and EPS liners are several progressive, low-friction tower elastomers that provide the advanced ODS system with improved travel (+30 percent) and energy-transfer mitigation at low-, mid- and high-velocity accelerations (both linear and angular). The EPS is fitted with a removable, washable comfort liner featuring Dri-Lex anti-bacterial fabric and emergency quick-release cheek pads. The shell also features a brow rib for increased structural integrity above the large eyeport, a cushioned EPP-lined chin bar with sternum pad and clavicle cutaways, and a cervical protection zone in back. The visor is also attached with shear-away screws. The tri-composite shell is built for superior energy absorption, and it has a PU-over-molded, EPP-lined chin bar. Comfort-lined straps have titanium D-rings, as the whole helmet is designed to be light (medium weight 1480 grams, or 3.26 pounds) and meets or exceeds DOT, ECE, ACU and ASTM standards. Ventilation is via nine intake and six exhaust ports with metal-mesh inserts. The ATR-2 comfort liner is made of Dri-Lex fabric and has five parts—the main liner, cheek-pad covers and chin-strap covers. The cheek pads have nylon red pull handles for quick removal by emergency personnel. The helmets come with a cool carry bag with zippered pouch for holding the two user manuals, decals and spare visor shear-away screws. It’s said that, “If you have a $10 head, wear a $10 helmet.” The 6D ATR-2 helmet was designed and developed by racers for racers to deliver the most impact mitigation on the market, and tests show the ATR-2 transferred 33-percent less energy than a leading premium-brand helmet with MIPS. Dirt bike and ATV riders want the best protection money can buy, and the ATR-2 transfers the least angular acceleration to the wearer. And it can be rebuilt after a head-plant. Obviously, we don’t go out and crash on purpose. We got a 6D ATR-2 Strike in XXL, and the fit is fantastic. It’s the best-fitting helmet Lumpy has ever worn (aside from the 6D ATR-1). You can apply pressure to the EPS liner at the back of the ATR-2 and feel and see it deflect. We can wear the 6D ATR-2 for hours on end with absolutely zero discomfort, including the neck, as it’s light. Venting is excellent but not overwhelming in cold weather. The comfort liner and cheek pads are super comfortable, and different-sized pads can be had for fine-tuning the fit. We did test the quick-release cheek pads, and they work perfectly. This is one super-comfortable lid, but the visor could be longer. The 6D ATR-2 Strike is a work of art as well as technology, and it comes with a three-year warranty. It fits superbly and looks great, and it can be rebuilt if you ever do test its advanced ODS system in a crash. While it’s expensive at $695, the ATR-1 is being blown out at $425–$495 online, but it can’t be rebuilt like the ATR-2. For multi-OHV enthusiasts, the 6D ATR-2 is an investment and especially useful to dirt bike and ATV riders and racers. 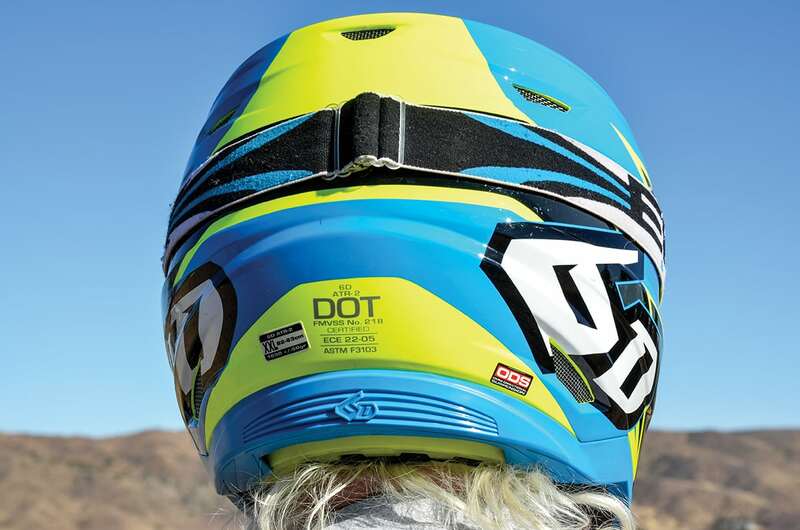 Those who UTV exclusively can also benefit from all of that safety technology and comfort, but those that strap in with harnesses can save money and get the same technology from 6D’s ATB-1T 3/4-coverage mountain bike helmet, which is on sale for $175 online. Impacts with cage tubes can generate gnarly linear and angular impacts, which are minimized by 6D’s Advanced ODS. 6D also makes ATS-1 street bike helmets, so we’d like to see a clean-air port added for us off-road enthusiasts in addition to the ATR-2’s advanced ODS.